Everton boss Ronald Koeman reveals that he would be ‘pleased’ to see Manchester United skipper Wayne Rooney return to the Toffees. 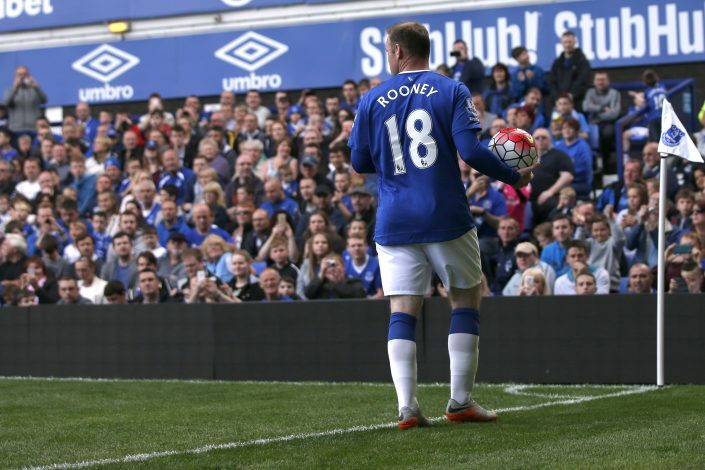 Wayne Rooney was a product of Everton’s Youth academy, making his senior debut for the club in 2002. He spent two seasons with the Toffees, making 77 appearances and scoring 17 goals before completing a massive £25.6 million move to Manchester United in 2004. Since then, the English striker has featured prominently in the Manchester United squad, making 532 appearances to date and scoring 246 goals – a few shy of Sir Bobby Charlton’s Manchester United record. However, the 31-year-old has experienced a massive drop in form during recent seasons, and has subsequently been dropped from the starting line-up at both club and country levels. Jose Mourinho, who maintains that he would never sell Wayne Rooney, hasn’t started the skipper in a Premier League match for well over a month. Therefore, most of Rooney’s game time has come in Cup matches. Everton boss, Ronald Koeman, still believes that Rooney has a lot to offer, and wouldn’t mind seeing him wear an Everton jersey again. Everton themselves have been experiencing a bad run of form, failing to get a win during their last 4 matches. However, the club still remains 6th in the Premier League table, 1 point above Manchester United. Koeman also spoke about Everton’s upcoming match against West Ham, stating that it is a ‘must-win’ for the club given their recent run of form.